Posted on 2nd November 2018	by MyHome.ie	in Blog, Commercial Blog, General, Property News, The Investor, The Overseas Investor	with No Comments on Is property a good investment? The below graph from the CSO shows average, national, second-hand house prices going back as far 1975 up to the end of 2016. If we draw a line from end 2016 horizontally back to the point where prices were at 2016 levels, we get back to early 2009 and again in late 2003. Anyone who bought, roughly speaking, between 2004 and early 2008 is yet to see the market rise back to the levels that they paid. In the normal course of events, prices would ultimately recover to pre-crash level just as stock markets recovered slowly after the dotcom and subprime collapses. Alas, one key structural regulatory change has occurred that mitigates against the market recovering to 2008 levels in the short term at least. This is the Central Bank’s limit of 3.5 times salary cap on borrowings. 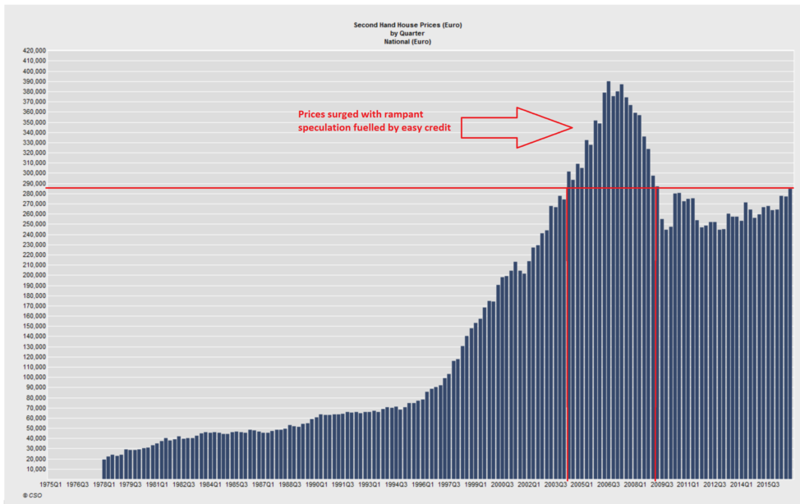 While no cap existed in 2008, purchasers borrowed well in excess of these levels and drove prices up. Now the Central Bank is protecting buyers from themselves and preventing them from borrowing as much as they did back in 2008 and this is keeping the handbrake on house price inflation. However, suppose an investor bought into the Irish property market in 1990 and held until end 2016. The average house price at the start of the period was approximately €60,000 (converted from Punts) and at the end was approximately €290,000. This implies a compound annual growth rate of 6.25%. This excludes the rent. Assuming the property generated a net rental yield of 6% throughout the period, that would push the return into double digits over the period. Despite Ireland suffering the greatest collapse in property prices the country has ever seen, an investor who held the asset for the long run would still have seen not only preservation of capital but a respectable 6% annual growth rate, excluding rent. When rent is added back in, the returns look attractive if not spectacular. On this analysis, property in Ireland would seem like an attractive option for a prudent investor who intends to hold for the long run. The views expressed in this article are those of the author, Eddie O’Driscoll, and should not be taken as formal financial advice. Eddie O’Driscoll is the founder of Auctioneera, a fixed price estate agent in Ireland.